An Emirati prince has sought asylum in Qatar, amid the ongo-ing diplomatic feud opposition the tiny Gulf country and its neighbors, after he fell out with Abu Dhabi Crown Prince Mo-hammad Bin Zayed. 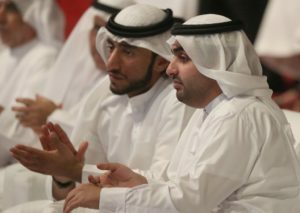 Sheikh Rashid Bin Hamad Al Sharqi, the second son of the Emir of Fujairah, one of the seven emirates that make up the UAE, was given shelter in Qatar after he showed up at the Qa-tari embassy in London on May 19. He has been living in Doha since May 23, reports say. Sheikh Rashid who was chairman of Fujairah’s Culture and Media Authority, in an interview with the New York Times, ac-cused Emirati authorities of blackmail and money laundering but could not provide evidence for his claims. He told the US media that UAE intelligence services, at the in-struction of Abu Dhabi, which is the most powerful of the seven Emirates, blackmailed him. He said they threatened to release “embarrassing videos of a personal nature,” adding that the videos were “fabricated” and if released could harm his host Qatar. The young royal, 31, also claimed that he was forced to trans-fer millions of dollars to people around the world, connected to the intelligence services. He said he sent as much $70 mil-lion to Jordan, Lebanon, Morocco, Egypt, Syria as well as Ukraine and India. The transfers, he said, violated Emirati and international laws against money laundering. Sheikh Rashid also claimed that he has been asked to replace his elder brother as the Crown Prince of Fujairah. Sheikh Rashid also slammed Abu Dhabi Crown Prince Mo-hammad Bin Zayed, who is the UAE’s Defense Minister, for having imposed the country’s involvement in Yemen on the six other Emirates. The UAE and Saudi Arabia have been leading an international coalition fighting Iran-backed Houthi rebels in Yemen since 2015. Sheikh Rashid said Fujairah forces make up the largest chunk of the UAE troops and that the majority of Emirati soldiers killed in Yemen come from Fujairah. The 31-year old royal’s defection took place amid ongoing diplomatic crisis between Qatar and its regional neighbors namely Saudi Arabia, UAE, Bahrain and Egypt. Written by: Jaber Ali on July 16, 2018. Posted by Jaber Ali on Jul 16 2018. Filed under Gulf News, Headlines. You can follow any responses to this entry through the RSS 2.0. Both comments and pings are currently closed.